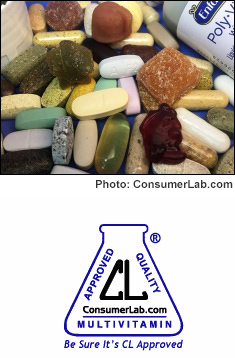 46% of the multivitamins selected for testing failed testing for not meeting quality specifications. Most gummy formulations did not contain the listed amounts of nutrients — having far less or far more. Several tablets did not break apart quickly enough. Lists enough of each essential vitamin and mineral. Check your own requirements using our RDA table or the detailed information for each nutrient below. Doesn't contain too much of any nutrient (i.e., exceed tolerable upper limits), as this can negate the benefits and increase the risk of toxicity. This is not indicated on the label but is noted by ConsumerLab.com for each of the reviewed products in the 2nd and 4th columns of the table below. Is of high-quality, delivering its listed nutrients without unacceptable contamination. Check that it has been Approved by ConsumerLab.com in the results table below. If you eat a well-balanced diet (including fruits, vegetables, grains, and dairy) and have no special nutritional needs (such as when pregnant), you may not need a multivitamin/multimineral. If you're not sure about your diet, a multi can help provide required vitamins and minerals. Taking a modest daily multi is safe and may slightly reduce the risk of certain cancers. In women, it may also reduce the risk of death from cardiovascular disease and, in men, it may reduce the risk of cataracts. Multivitamins/multiminerals (or "multis") are the most popular supplements among the general population in America. While they can help make up for shortcomings in your diet, the benefits for most people are uncertain. In 2013, the U.S. Preventive Services Task Force reported that there is inadequate evidence regarding a benefit or risk of harm with multivitamins in healthy adults without nutritional deficiencies (excluding women who are or may become pregnant) (USPSTF 2013, based on studies reviewed in Fortmann, Ann Int Med 2013). There is some evidence that taking multivitamins is associated with a reduced incidence of some types of cancers in certain populations. For example, a major study of male physicians 50 years of age or older found an 8% lower incidence of cancers among those taking a relatively modest-dose daily multivitamin compared to men taking placebo -- although there was no reduction in the mortality rate during the study period of approximately 11 years (Gaziano, JAMA 2012). The greatest reductions in cancer were among men with a prior diagnosis of cancer (27% fewer new cancers) and men with no family history of cancer (14% fewer cancers). There was no significant reduction in prostate cancer -- the most common type of cancer in the study, however, there was a 12% reduction in all other cancers combined. The supplement used in the study was Centrum Silver, which is similar to the Centrum Silver (and several similar store brands) reviewed below, although the formula in the study dated from 1997 and contained 400 IU of vitamin D3 (now 500 IU), 5,000 IU of vitamin A with 50% beta-carotene (now 2,500 IU with 40% beta-carotene), and did not include the small amounts of lutein and lycopene in the current formula. In the opinion of ConsumerLab.com staff, the recent changes to the formula would seem unlikely to have negatively affected outcomes and the new formula may be beneficial. This same study of Centrum Silver found no significant effect on the risk of cardiovascular disease, including no significant reductions in heart attack, stroke, or death from cardiovascular disease, among men taking the multivitamin versus placebo (Sesso, JAMA 2012). Researchers found that taking the multivitamin was not associated with any gastrointestinal side effects, fatigue, drowsiness, skin discoloration, or migraine, but there was a 7% increased risk of skin rashes. This study was among 18 multivitamin studies included in a broader analysis that concluded that multivitamin/multimineral supplementation "... does not improve cardiovascular outcomes in the general population." However, most of the studies included in the analysis did not characterize the multivitamins used, making it impossible to generalize this conclusion to all formulas nor to populations with specific conditions or deficiencies (Kim, Circulation 2018). Additional analyses of this long-term study using Centrum Silver among male physicians found no benefits on cognition or verbal memory, although the researchers noted that the population studied may have been too well-nourished to benefit from a multivitamin (Grodstein, Ann Int Med 2013). A 9% decrease in the risk of cataract was found among those taking Centrum Silver in this study, compared to those taking placebo, although there was no decrease in the risk of developing visually significant age-related macular degeneration (AMD) (Christen, Am Acad Opthal 2013). However, among participants who were randomized to also take a separate, daily, high-dose vitamin C supplement (500 mg synthetic ascorbic acid -- about 6 times the RDA), there was no reduction in cataract risk, while the risk of cataract decreased by 18% among those taking Centrum Silver (which contains 60 mg of vitamin C) without the additional vitamin C supplement. A study in adults who previously suffered heart attacks found that giving them high-dose vitamins and minerals did not result in a statistically significant reduction in further cardiovascular events compared to those receiving placebo (Lamas, Ann Int Med 2013). The supplement consisted of 28 vitamins and minerals given as 6 large caplets daily and was designed by complementary and alternative medicine practitioners. It included amounts of vitamins A, C, and E and most B vitamins at several times the Daily Value, and up to three times the Daily Value for folate, selenium, chromium, and molybdenum. Patients took the supplement regimen for one to five years (median was 31 months) and were followed for two to five years (median was 55 months). Many people dropped out of the study due to the complexity of the regimen, although there was no evidence of harm. There is little evidence from clinical trials showing that a specific multi can reduce the risk of dying from cardiovascular disease, cancer, or any other cause (Park, Am J Epidem 2011). However, a U.S. study found that people who had used multivitamin/multimineral supplements for at least 3 years were 35% less likely to have died of cardiovascular disease over the following 20 or so years, compared to those who had not taken a multi. This positive finding was largely driven by results for women in the study, who were 44% less likely to have had a cardiovascular-related death. None of the subjects had cardiovascular disease at the start of the study and the results were adjusted to avoid potentially confounding variables including race, education, aspirin use and blood pressure. Interestingly, the apparent benefit did not occur for people who had used multivitamins which lacked minerals, nor among people who had taken multis for less than 3 years at the beginning of the study (Bailey, J Nutr 2015). In addition, a study of women aged 50 to 79 years with invasive breast cancer found that those who used multivitamins were 30% less likely to have died from the disease, compared to non-users, over an average period of 7 years (Wassertheil-Smoller, Breast Canc Res Treat 2013). Adjusting for factors such as age, race, and the use of other supplements did not substantially change this estimate. Unfortunately, the study did not evaluate the specific multivitamin formulas used, so it is impossible to say which formula, if any, was associated with the lowest mortality. There's no standard formula for multis, so the ingredients will vary dramatically from one brand to another. It would be impossible to make a one-size-fits-all multi anyway because nutritional needs depend on age, gender, health status, and several other factors. Multivitamins also differ greatly in terms of quality. The large number of ingredients in these products opens the possibility for more things to go wrong. One potential problem is that the ingredients and amounts of ingredients in the bottle may not match those listed on the label. And, as with many mineral and herbal products, there's also a risk that a multi could be contaminated with lead or other toxins. No U.S. agency routinely tests multis or other dietary supplements for their contents or quality. That's where we come in. As part of our mission to independently evaluate products that affect health and nutrition, ConsumerLab.com recently purchased 35 of the leading multivitamin/multimineral products sold in the U.S. and Canada (including seven multis intended for pets) and put them to the test in the laboratory. We couldn't test every ingredient in every product, so we chose to focus on several standard nutrients including folate (folic acid), calcium, and vitamin A (retinol and beta-carotene). We made some substitutions as needed. If a product didn't contain folate, for example, we tested for vitamin C instead. If it didn't contain significant calcium, we checked the levels of iron or zinc. The amount of iodine was also checked in every prenatal vitamin claiming to contain it. We also tested tablets for disintegration (how long it takes to break apart in liquid); if tablets can't break apart fast enough, less ingredient may be available for absorption by the body. In any product claiming to contain whole herbs or more than 250 mg of minerals per daily serving, we also tested for potential contamination with arsenic, cadmium, and lead. Any product claiming to be gluten-free was tested to be sure it met this claim. Products had to pass testing for all of these criteria, as well as meet FDA labeling requirements, to earn our "Approved" rating in the table below (see Testing Methods and Passing Score). Multivitamin and Multimineral Supplements Review!